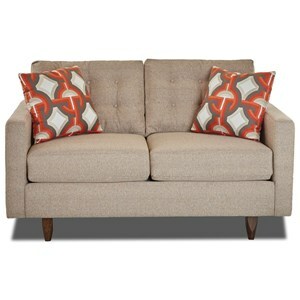 The bold shapes of this contemporary chaise lounge are sure to be a striking accent piece in your living space. 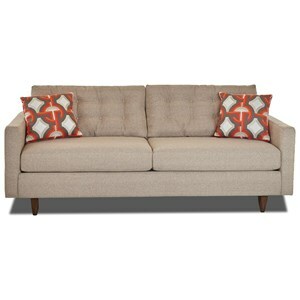 A low profile silhouette of slender track arms and geometrically squared cushions are perched upon tall, tapered wood block legs to create this fashionable look. Comfortable as well as stylish, this chaise is fitted with high density seat cushions for a pleasing and enveloping comfort. 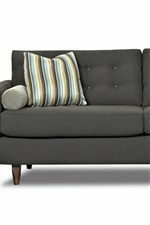 Accent pillows add to the soft feel, and are customizable in a wide range of contrasting colors and fabrics. 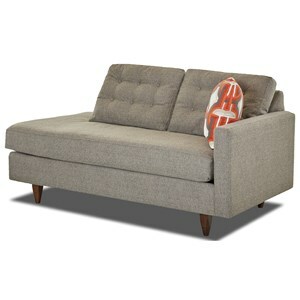 The Craven Contemporary Left-Arm-Facing Chaise Lounge with Tufted Back by Klaussner at Value City Furniture in the New Jersey, NJ, Staten Island, Hoboken area. Product availability may vary. Contact us for the most current availability on this product. With a look that's straight out of your favorite high fashion magazine, furniture from the Craven collection is impossible to ignore. 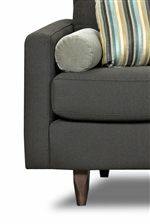 Slim pieces perched atop tall wood block legs, and button-tuft detailing create the striking shapes of this collection. 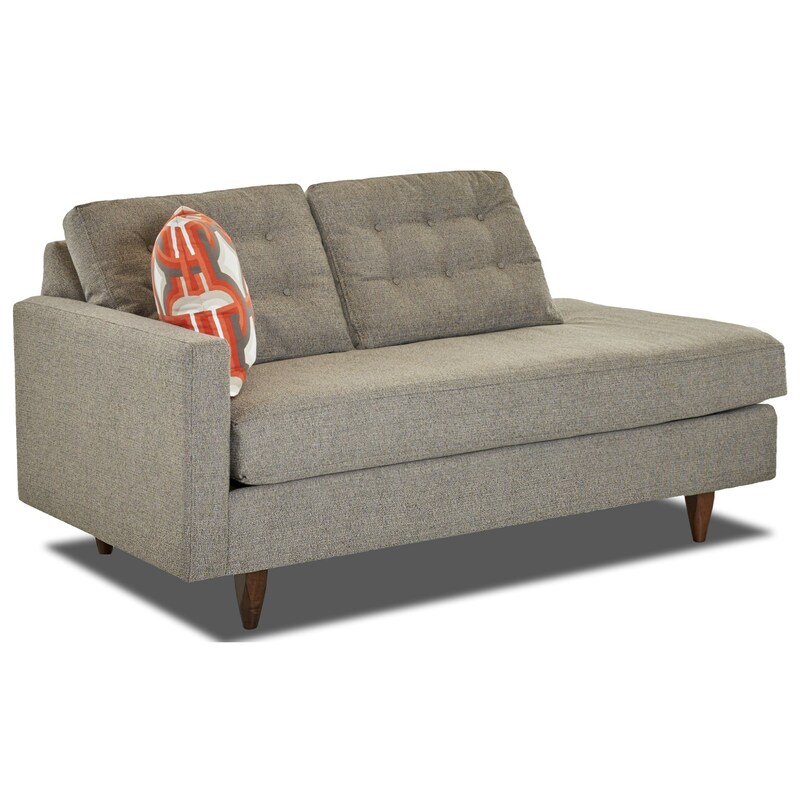 The exceptionally stylish sofa, loveseat (not shown), chair, and ottoman (not shown) are also fitted with resilient high density foam seat cushions to provide you with the best comfort experience. 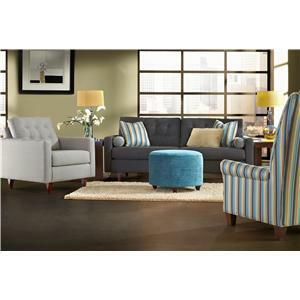 Customize the pieces from the Craven collection in your choice of upholstery and accent pillow fabrics to create the look that speaks to you. 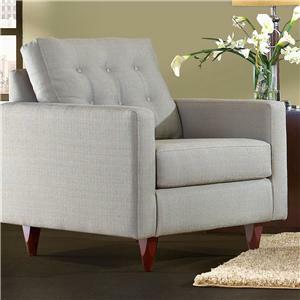 The Craven collection is a great option if you are looking for Contemporary furniture in the New Jersey, NJ, Staten Island, Hoboken area. 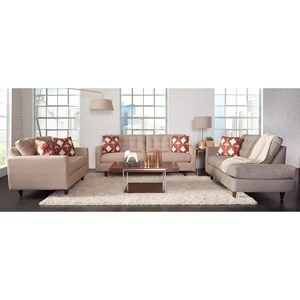 Browse other items in the Craven collection from Value City Furniture in the New Jersey, NJ, Staten Island, Hoboken area.